The first time you experience the beauty of the Santorini caldera in person, it takes your breath away. To ensure you make the most of your Santorini trip, we have our luxury travel guide complete with the best of hotels, restaurants, and things to do in Santorini. Santorini is part of a small, circular group of volcanic islands in the Aegean Sea (about 124 miles from Greece’s mainland). On Santorini, circa 2000BC, the city of Akrotiri was an extremely advanced civilization for their time. They are believed to be the first civilization to create water closets (toilets). The entire society, however, was destroyed during a massive volcanic eruption around 1650 BC. The eruption blew a massive hole in Santorini, and left the originally circular island as a crescent shape. Beginning in the 1970s, Santorini’s caves and original settlements started being converted into hotels. Today, Santorini is a huge international tourist hub, catering to 1.5 million visitors per year. Santorini’s only airport is JTR, and there are direct flights from Venice, Rome, Naples, Athens, London, and many more due peak season (June – September). Santorini is also accessible via ferry from Athens (5 hours) as well as other islands in the Greek Cyclades. Mykonos is only 1 hour away by high-speed ferry. Your best resource to research ferry prices and routes is GTP.gr. Oia (“eee-ah”) is home to one of the best sunsets in the world. Located all the way at the end of the island, you can literally watch the sun fade into the end of the world, as if the Earth were flat or maybe it is, Kyrie Irving?. 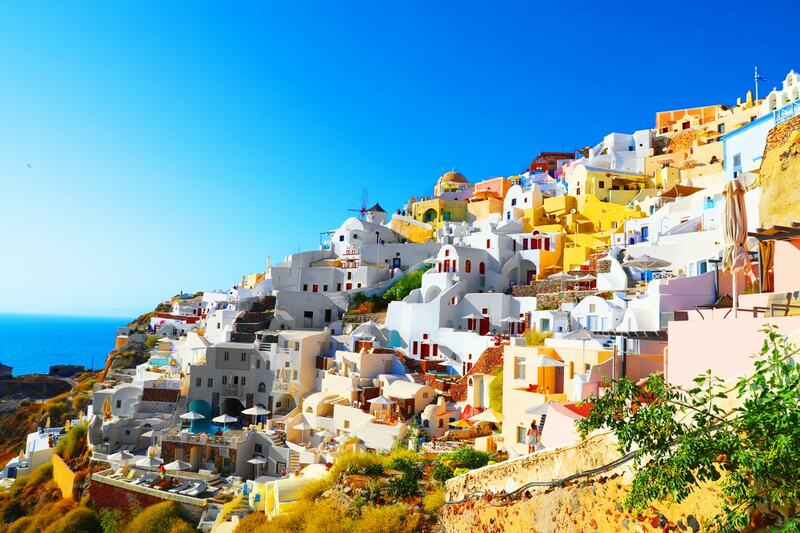 Oia is also home to the all white and blue homes and most likely any picture you’ve seen of Santorini is of Oia. Oia is big enough that you can walk around to restaurants, and bars, but small enough that you can walk end to end in about 20-30 minutes. If you want a walkable town, plenty of bars and restaurants, and amazing scenery then Oia is for you. Imerovigli is known to be a honeymoon spot. The town is the smallest of the three, and has the least amount of tourists. There are still a couple of restaurants and the occasional bar, but this town is mainly for laying by the pool and relaxing. What’s great is Imerovigli is just a quick 15 minute walk to Fira, putting you close enough to be able to enjoy all of the nightlife and restaurants of Fira, with the peace and tranquility you want. The hotels are known to be a bit more affordable than Oia, but still very pricey. If you’re looking to completely get away from everything, still want beautiful hotels and scenery, then this is the village for you. Fira is the island’s capital, and has the same whitewashed towns as Oia on one side, and the business of the island on the other. Fira has a big selection of affordable hotels. Fira is home to all the nightlife. By this I mean, in Oia there are bars and restaurants, but everything closes by 11-12 at night. In Fira, you can find clubs and bars open all night long. The village still has some of the charm of Oia, but it’s definitely not as pristine. It is 15 minutes to Imerovigli, so you have the pure beauty you’re looking for within close reach. Fira is about 30 minute drive to Oia. If you’re looking for nightlife, plenty of affordable hotels, a ton of restaurants and bars open at all times, and don’t mind some grunge with your amazing views, then Fira is for you. We’ve personally stayed at Mystique and Andronis Boutiques. Both in Oia, and we highly recommend each. We used SPG points to stay at Mystique, which is probably one of the best ways you can use your credit card points. You must take a cruise in Santorini. It’s the best way to experience all of the towns and the beauty of the island. If you do the sunset cruise, it’s also the best way to take in the sunset. You must also see the sunset from the edge of Oia. Your best bet is to make reservations at a restaurant, so you can avoid the hordes of people. Every night, 800 people all crowd into the tiny streets and it’s awful unless you’re sitting peacefully at a restaurant or bar. Relax and gaze at the caldera. The views of Santorini are breathtaking, and it’s worth spending an entire day just sitting on a pool chair or in a pool and gazing at the beauty. Santorini has the best beach weather from June to September. June through September the temperatures range from high of 81 to low of 69 Fahrenheit. The shoulder season is May and October where you can find hotel prices at 50% of their peak prices. In May, the high is 73 and the low is 62. In October the high is 73 and the low is 64. For a casual lunch or dinner, you need to go to Melitini. They serve a fantastic Santorinian Salad (with local cherry tomatoes), as well as an assortment of small dishes, all were amazing. We had the octopus, homemade sausage, grilled feta, and of course tzatziki. Be aware though, that they can get busy, and they typically only seat for table for an entire night, so make sure to make reservations beforehand (even for lunch). We also loved Lauda, part of the Andronis Boutique Hotel. We were lucky enough to have a tasting menu prepared by a chef who flew in from Athens. It was fabulous. We recommend only dining here for dinner, not lunch. Pitogyros has 4.5/5 and 1,249 reviews on TripAdvisor and it’s price is $/$$$$ (which means it’s affordable). It’s a tiny hole in the wall that serves some of the best gyros and greek salads we’ve ever had. Plus, it’s cheap. This place was so good we ate there for lunch and dinner (because it’s so hard to find a table for dinner at 9pm). Santorini has such a classic color scheme that you want your outfits to either match perfectly or contrast perfectly. Unlike a place like Lisbon, where there are a lot of colorful mosaic tiles, in Santorini you want to stay away from exotic prints and wild patterns. If you’re visiting in the high season, it gets really hot in the sun in Santorini, and linen is your friend. Some of our favorite brands that produce clothes perfect for Santorini are Orlebar Brown, Vilebrequin, Vince, Theory, and Zara.